Making cheese involves first coagulating milk to remove the whey from the curd then fermenting it. I have already played with fermenting milk without removing the whey when making yogurt. So I decided to try my hand at a quick acid coagulated cheese before stepping into rennet coagulation, and fermented/aged cheese. The procedure from Good Easts was pretty simple. I took a half gallon of skim milk and added .375 cups of distilled white vinegar. In yogurt the lactic acid bacteria create the acid that slowly coagulates the milk, in this case the acetic acid from the vinegar acts very quickly after a few minutes of stirring followed by 30 minutes of sitting. The curd clumped together in 6 or so large blobs each of which looked like warm mozzarella. This is very different than rennet coagulation which makes a solid coagulated block that needs to be cut before it is drained. After 30 minutes I strained the curd from the whey through a tea towel laid on top of colander. Once most of the whey was gone, I rinsed the curd in cold running water for 5 minutes mixing it and squeezing it as I went to remove the acid and develop the curd. After that I squeezed the curd dry, broke it up, and tossed it with 1/2 tsp of kosher salt. I then added a few teaspoons of half and half (you could use anything from skim milk to cream) to give the cheese back some moisture. The resulting cheese was somewhere between cottage cheese and ricotta, the curds were a bit too small and grainy, and it wasn't quite juicy enough for cottage cheese. Not to say that it wasn't a tasty snack, just that it wasn't just like commercial cottage cheese. It was a worthwhile experiment, but yielding under 1 cup of cottage cheese for 1/2 gallon of milk it probably isn't worth the time or money to make regularly in place of commercial versions. Look for more information on cheese as I go forward, I hope to start with a soft cheese like camembert before moving onto firmer longer aged cheese. Maybe try extracting your own citric acid from a Penicillium culture fed on pure sucrose, and using that to coagulate the milk, and using the Penicillium to make a soft bleu cheese? Is your citric acid suggestion related to making cottage cheese, or simply part of the suggestion for making a soft bleu? Thinking about making cheese at this point reminds me of thinking about beer before I started brewing, pure confusion and wonderment at the sheer variety of what can be created. Hopefully, I will get hooked on cheese making the same way I am on brewing. I’m just really looking forward to the day that I can have people over and serve homemade cheese on homemade sourdough, with a glass of homebrew. Just read your post about cottage cheese, and though it's pretty old and you may have figured it out by now, I thought I'd share my experience. The best way to make cottage cheese is with clabbered milk. Get raw milk (this won't work with pastuerized, as it rots rather than clabbers), let it sit for a couple of days in a warm place until it is thick. 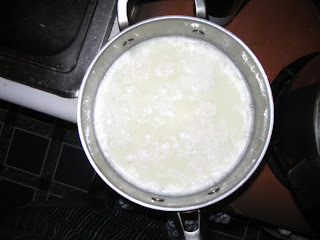 Cut into large curds, and heat slowly to about 135° F, stirring occasionally. 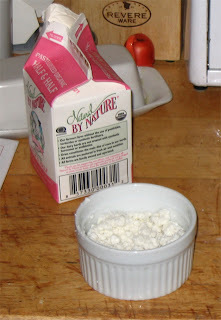 When enough whey is expelled, drain the curds, salt, (add cream if you wish to make creamed cottage cheese), and enjoy. It doesn't taste like storebought cottage cheese. The flavor is richer and more complex.